Above: My tent camp at Turquoise Lake in the Mission Mountains Wilderness. Note: As always, all of my photos can be found at Flickr. Here’s the setting: It’s late September, 3 am, dark and windy, and I’m putting on boots and a jacket in my small tent after surviving close encounters of the oreamnos kind earlier in the night. I’m high-ish in the Mission Mountains of Montana, under a clear night sky, happy to have been nowhere near a television for the first presidential debate, and wondering if there are any mountain goats bedded down nearby. All is good. 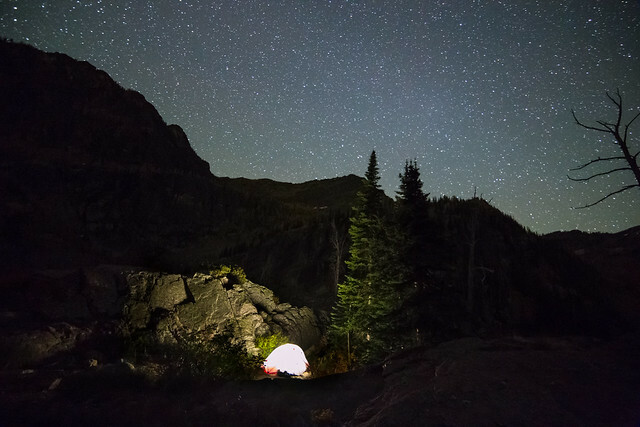 I crawl out of the tent, shining my headlamp around, looking for but not expecting to see any luminous eyes in the darkness. I strain my ears for unusual sounds, but all I hear is the wind rushing through the trees and passes around me, and the lapping of the waves on the shore from the lake below. I notice it’s a bit lighter in the east than I expected it to be, and I absentmindedly wonder why that would be as I gather my camera gear and walk the short distance to the rock outcropping where I’m going to start taking pictures. I start the process like I always do, setting up the camera on the tripod, pointing in the general direction, pairing the camera to my iPad so I can view the raw images on that screen rather than the small camera back, and start shooting. In this case I’ve set up the camera to look over the lake, toward the sliver of the Milky Way that’s visible to the naked eye. I snap a few shots, make some adjustments, look up, down, and around for shining eyes – I am in grizzly country after all, and I don’t know what’s out in the darkness – and snap a few more images, making adjustments as I go. After one adjustment (above), I noticed something strange in the image… a green glow to the northeast in the corner of the image. That’s strange, I think to myself. There’s only one thing I know of that would do that… the aurora borealis. Getting pretty excited in a hurry, I quickly pointed the camera towards the lighter grey glow on the northeastern horizon, and fired off a few exposures to see what I could capture in the images. Sure enough, it was the Northern Lights. 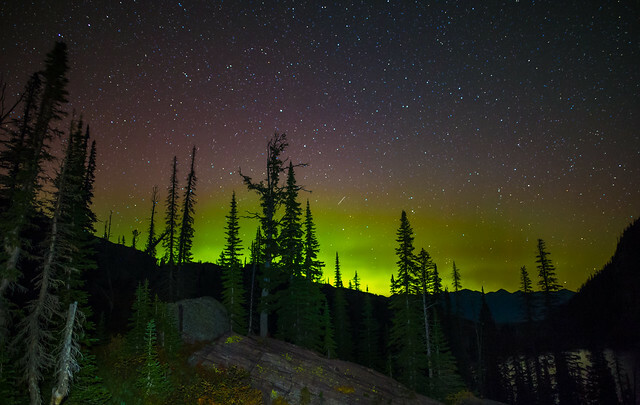 Above: The aurora seen from Turquoise Lake, over the Swan Valley. This is where lucky stroke number 3 comes in… For a few years now I’d idly daydreamed of seeing and photographing the aurora. Where I live Idaho, the Treasure Valley along the Snake River Plain, the aurora only makes rare appearances, and is usually low on the horizon and drowned out by light pollution from the greater Boise area. During most of the powerful magnetic storms that could send the lights dancing this far south, my view has been blocked by cloud cover. In the depths of winter, when skies are darker (longer nights) and I’m visiting family in Montana, it’s typically been cloudy and snowing or clear but extremely cold when the lights appear, so I’d never really gotten out to see them. On this trip, it never occurred to me to check the potential for aurora activity. Like they say… better lucky than good. I’d personally prefer lucky and good both at the same time, but I’ll take whatever I can get. 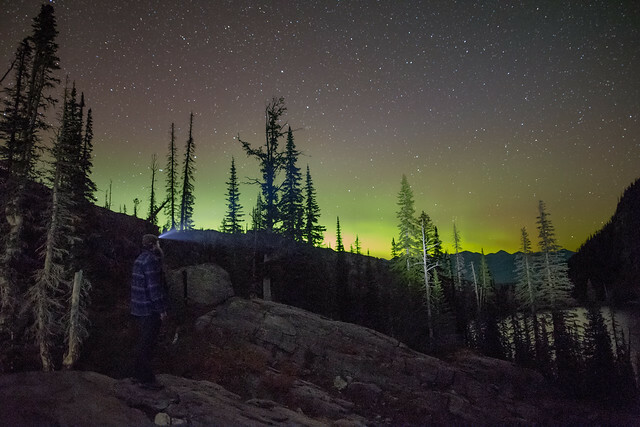 Above: When you get the chance to take a selfie under the stars with the aurora on the horizon, who can say no? 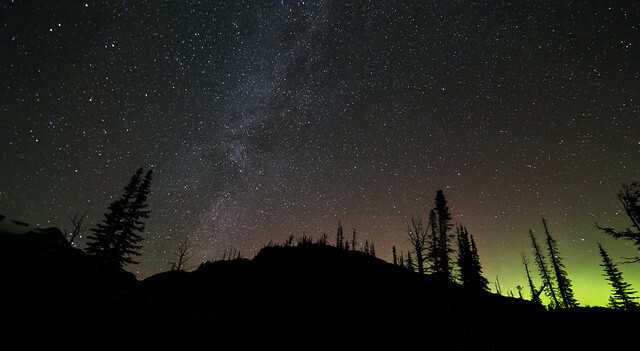 Above: Stars and the aurora over the Swan Valley, with a whitebark pine snag silhouetted against the sky. 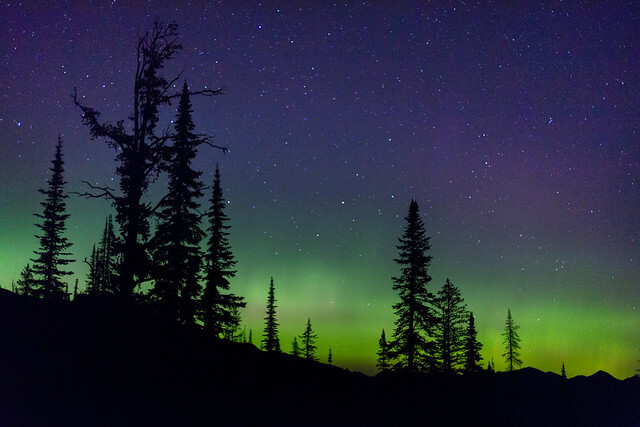 Above: Closer look at the Northern Lights, with a 50mm lens of all things. I spent the better part of an hour and a half taking pictures of the aurora, moving around, trying to remember all the tips and tricks I read about over the years, and experimenting with various exposures and lens combinations. I even tried a few shots with my “plastic fantastic” 50mm f/1.8 lens, and the result was one of my favorite images from the set (see above). 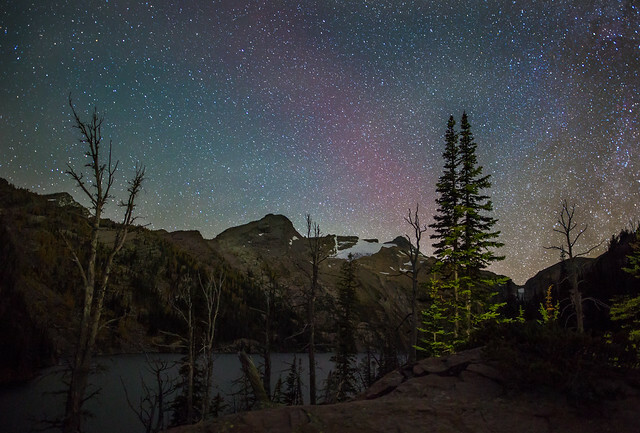 Above: Turquoise Lake under the stars, with a bit of the Milky way on the right side, and what I think is some auroral activity in the center. After I spent a fair amount of time goofing off with the unexpected gift of the Northern Lights, I snapped a few images of what I’d actually came up here to photograph, Turquoise Lake under the stars. While the new moon made it a bit difficult to pull off quite what I’d envisioned for the past few years, I still managed to come pretty close, as you can see above.The wind kept me from getting any images of stars reflecting in the lake, but I’m happy with the results. After doing most of what I wanted to do, and not really feeling like wandering around too much more on the steep rocks in the dark, I called it quits around 4:30 in the morning. As I crawled into my sleeping bag I felt pretty satisfied with myself, and pretty blessed to have been lucky enough to have not one but two unexpected bonuses – mountain goats and aurora – on this trip. 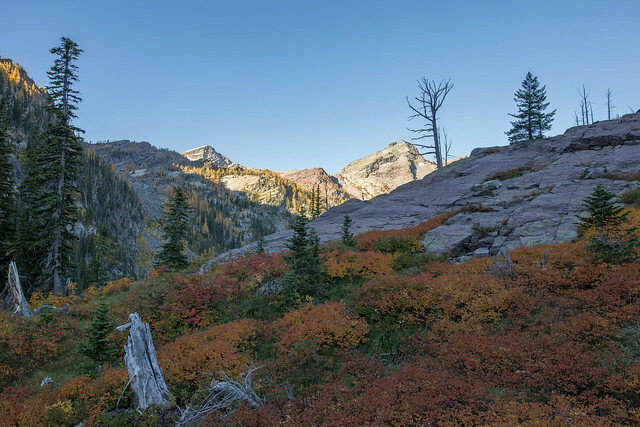 Above: Fall colors in the morning, Turquoise Lake. After waking up around 7 am, I wandered around a bit, taking some pictures of the fall colors and the sun hitting the far side of the lake. After a few hours of that I packed up, said goodbye to the lake and the goats, and headed down the trail. It had been a good trip. 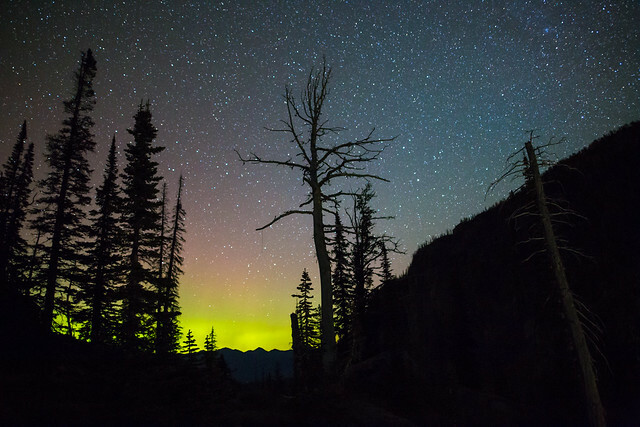 No bear sightings, no people at the lake while I was there, some mountain goat encounters, and an unexpected opportunity to photograph the Northern Lights. While I’d like to take credit for some extraordinary trip planning, sometimes it all just comes together, and you really are more lucky than good. This entry was posted in Personal, Wild Places. Bookmark the permalink. Those aurora pix are awesome!